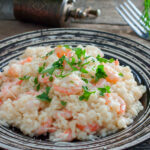 When I need to make a delicious, meatless meal, I never hesitate to turn to this Shrimp and Arugula Risotto recipe. It turns out creamy and delicious each and every time, and it is surprisingly easy to make. A bowl of Shrimp and Arugula Risotto. 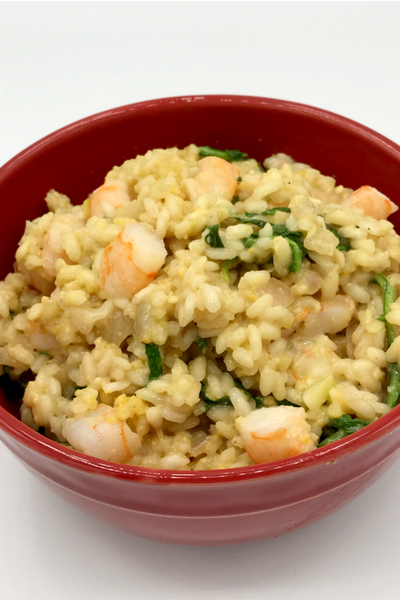 The combination of sweet and succulent shrimp and peppery arugula mixed in with the risotto makes this dish one of the most requested from my family and friends. When I first decided to try to make risotto, I became quickly confused when I was in the grocery store. I searched up and down the aisles looking for risotto rice. I had eaten risotto a handful of times in restaurants and I knew that it was a rice product. Arborio rice being toasted in the skillet prior to being made into Risotto. What I didn’t know was that risotto was an actual recipe, not a type of rice. In fact, it is a traditional Italian rice dish made from a specific type of short-grained, starchy rice called Arborio rice. The technique for making risotto involves stirring small amounts of hot stock or broth into the rice a little at a time. This allows the liquid to slowly be absorbed and the starches to be released. This results is rice that turns to a rich and creamy texture. The slow cooking process allows the rice to transition into creamy Risotto. 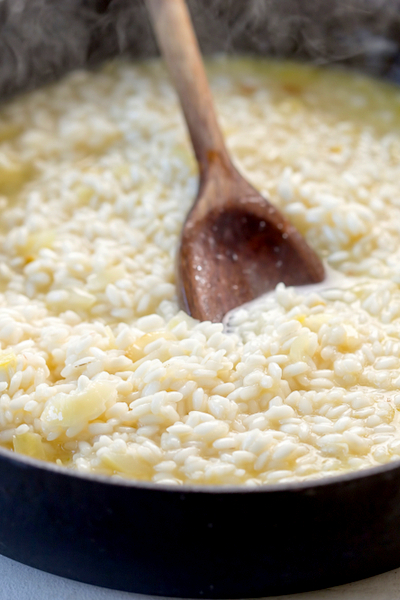 Historically, risotto is often made with butter, onion, white wine, and Parmesan cheese. 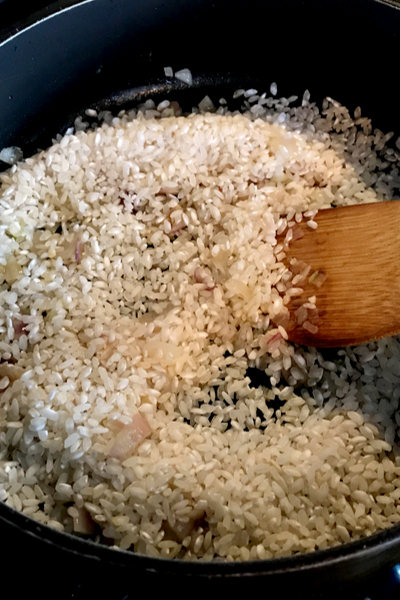 It is one of the most common ways to cook rice in Italy. Although risotto is a fantastic side dish, I wanted to make it part of a one pot, main dish meal. I was planning a luncheon which included guests who were pescetarians and those that were observing eating no meat on Fridays due to Lent. Baby Arugula provides a nice and subtle pepper taste to this recipe. So I knew that I would have to come up with a dish that would observe their dietary restrictions. I thought about making Pan-Seared Sea Scallops or even Air Fryer Salmon. But I wanted to make a one pot, complete meal. That is when I knew that my Shrimp and Arugula Risotto recipe was just the answer. All of my guests were able to eat fish protein. And there is nothing better than balancing out the sweetness of the shrimp with a little arugula. 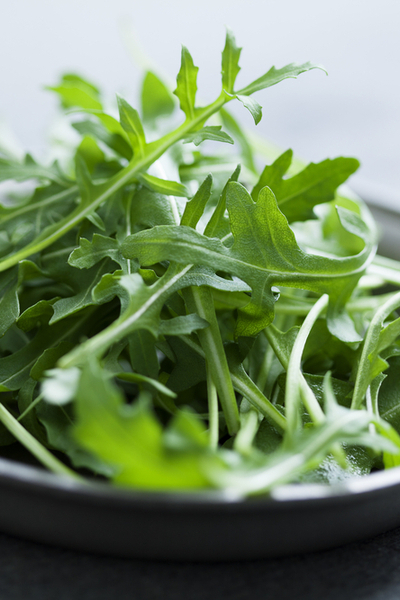 The arugula provides a slight peppery flavor to the dish. Combined with a little white wine and Parmesan cheese, and this dish is something to rave about. The arugula will wilt down once folded into the hot risotto. However, there is one last ingredient that makes this dish perfect. The addition of both lemon zest and lemon juice not only adds another layer of flavor, but it also freshens up the taste of this recipe. 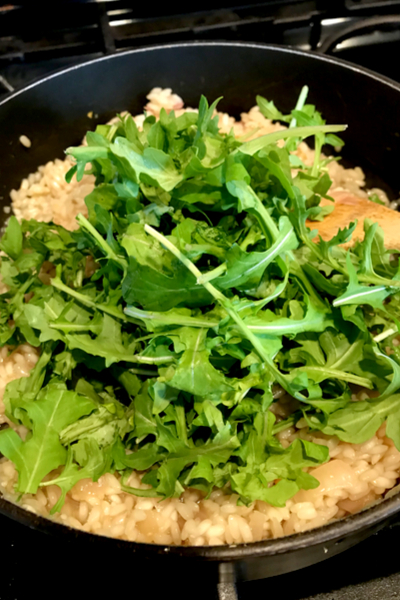 Adding in just a little bit of citric acid makes your taste buds awaken to appreciate the combination of flavors in Shrimp and Arugula Risotto. Simply zest the lemon using a microplaner and juice the entire lemon to use in the recipe. 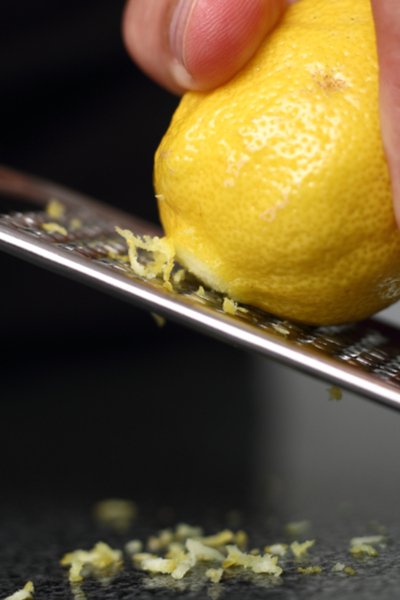 A microplaner makes zesting the lemon a breeze. Stir it in along with the hot broth and when finished, you will have a complete, one pot meal that is absolutely fantastic! Creamy risotto mixed with shrimp and peppery arugula and brightened up with lemon juice and zest for the perfectly balanced meal. In a medium sauce pan add the chicken broth and bring to a light simmer over medium-low heat. Reduce heat to low. In a large skillet over medium heat add 2 tablespoons of the extra virgin olive oil. Once hot, add the shrimp, 1/2 teaspoon salt and 1/4 teaspoon pepper. Cook until the shrimp are just opaque in the center. Remove from heat and transfer the shrimp and juices to a bowl. Set aside. Add the remaining 1 tablespoon oil to the pan. Add the shallots. Cook until tender, about 3 minutes. Add the garlic and cook for 30 seconds. Add the rice to the skillet. Stir well for 2 minutes. Add the wine to the rice. stirring often and cook until the wine is absorbed, approximately 2 minutes. Add 1/2 cup of the warm chicken broth, lemon zest and juice, and the remaining 1 teaspoon salt and 1/4 teaspoon pepper. Stir until most of the broth has been absorbed. Add an additional 1/2 cup of chicken broth and stir until absorbed. Repeat until 3 cups of broth have been used and risotto is creamy. You should have ½ cup of broth remaining. Stir in the arugula until it wilts. Add the cooked shrimp and Parmesan cheese. Stir in additional broth if needed until risotto is creamy.